Somehow my shoe collection has gotten very low. The shoe cubbies in my closet aren’t even close to full, which is odd for me. So lately I’ve been trying to rebuild my shoe wardrobe and pick up some basics to help enhance my wardrobe. Last night in Macy’s I went in looking for a low ankle boot in a chocolate brown or dark plum color and instead I came out with a pair of BCBG animal print shoe boots. Totally not on my list but totally fell in love with them. I also fell in love with the salesman that found me a 20% off coupon to use on the shoes too. My husband didn’t love them, he wanted me to get them in a grey and black color block but I ignored him and went with the animal print because this is more my neutral anyway. I’ve already put foot petals in them and have laced them up for their first day of wear today. I hope they turn out to be pretty comfortable so they can be my new winter staple. Any of you walk in looking for something sensible and come out with wild instead? I’ve thrown away quite a few pair of boots myself lately. I think I want these too. Cute! I’m currently in search of tall camel color boots to compliment my leather jacket. I think these would also be a go! Great find. Oh those booties are insanely fabulous! I think they will go with a ton. I want them for meeeee! you sound like me. with a new career move underway, i am in the process of rebuilding my wardrobe as well. just the other day i went into marshall’s for slacks and came out with a seqiun skirt!! lol…i couldn’t pass on it tho. price was TOO good. *drooling* I think I’ll be taking a trip to Macy’s on my lunch break! Adorable!!! I’m in love too! Can’t wait to see you style them. Those boots are amazing! 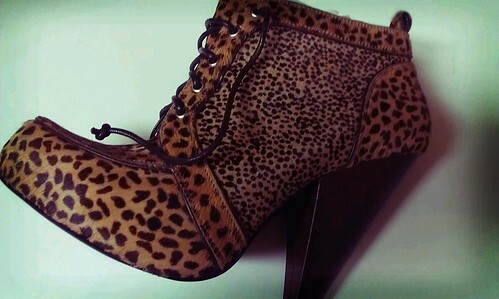 It’s hard to find good quality leopard footwear.